The midterm elections changed Dictator Donald Trump (DDT). Despite his declaration that the Democratic takeover of the House and many more state elected officials, including governors, the sullen DDT roars like a wounded bear. DDT fired Jeff Sessions as DOJ Attorney General. 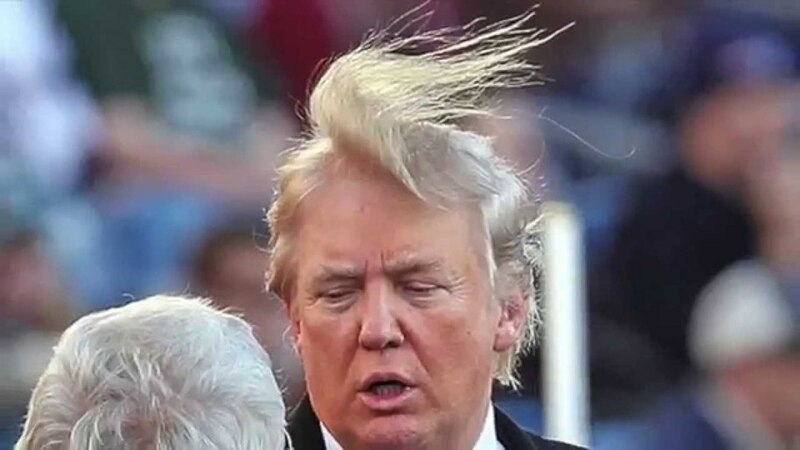 He tried to protect himself from Robert Mueller’s investigation by appointing a possible crrok and “constitutional nobody,” in the words of George Conway, the husband of DDT’s legal counsel Kellyanne Conway. The Wall Street Journal published information about how intelligence found evidence that he personally broke campaign laws. DDT created a war with French president Emmanuel Macron before his trip to Paris. He attacked UK Prime Minister Theresa May who had called him to congratulate him on his “election victory” by telling her that she isn’t doing enough to contain Iran, questioning her work on Brexit, and complaining on trade deals. He couldn’t be bothered to commemorate the dead soldiers that U.S. sent to World War I that ended 100 years ago. DDT didn’t bother to walk with the other 60 leaders attending the Paris Peace Forum but enthusiastically greeted Vladimir Putin. He’s sent hysterical tweets, accusing voter fraud in Arizona and Florida after Democrats narrowed the gap in voters from the Republicans. Kim Jong-Un, who DDT claims sent him “beautiful letters” after the two of them “fell in love” (DDT’s words), keeps building undeclared missile operating bases used to disperse mobile launchers for ballistic missiles, at least 20, after DDT announced they had agreed Kim would not continue. Robert Mueller’s investigation shows increased interest in Dmitri Rybolovlev, the Russian oligarch, who bought Donald Trump’s Palm Beach mansion in 2008 for $95 million and never lived in the mold-infested property after he was detained and questioned in Monaco on charges of corruption. DDT’s national debt just topped $1 trillion, headed to $1.3 trillion for the year—145 percent increase from 2017. This from the man who promised to eliminate the national debt. DDT-appointed Judge Dabney Friedrich refused to drop Mueller’s charges against Russian firm Concord Management and Consulting for attempting to swing public opinion for the U.S. election through social media posts. GM and Honda are ignoring DDT’s proposed rollback of fuel-economy standards and plan to proceed with its zero-emission vehicle sales program instead of manufacturing one type of car for 13 states, including California, with higher standards and another set for the other states. Fox network is also deserting DDT. Sean Hannity and Jeanine Pirro did give partisan speeches at a campaign rally before the midterm elections, but last month Fox’s chief anchor Shepard Smith said that the caravan from Central America—which hasn’t been mentioned since the election—isn’t an invasion. He said, “No one is coming to get you.” Ralph Peters, longtime Fox military analyst, quit. He gave the three divisions for the network: those who see DDT as “the new messiah”; cable news opportunists who fell in line; and respectable hosts who are “disgusted by what goes on there.” Fox filed an amicus brief in support of CNN when it sued the White House for pulling press credentials from its reporter, Jim Acosta. A huge disaster for DDT is the CIA report that Saudi Crown Prince Mohammed bin Salman (MBS) ordered the torture and dismembering of journalist Jamal Khashoggi in its embassy in Instanbul last month. DDT wants to keep MBS’s friendship to keep getting oil from his country and continues to support him. Part of DDT’s strategy to appease Turkey for not punishing Saudi is to return Fethullah Gulen, a 77-year-old ailing religious scholar who has sought asylum for 20 years, to Turkey for possible torture and assassination by President Recep Erdogan. The White House says that he has no plan for this, but the State Department is looking into Gulen’s return—although it’s just a coincidence and has nothing to do with MBS or DDT. The spokesperson for the State Department said that the case is handled by DOJ that says it knows nothing about extraditing Gulen to Turkey. According to the conservative Wall Street Journal, Michael Flynn and his son, Michael Flynn Jr., met with Erdoğan’s associates to plot the kidnapping of Gulen and deliver him to Turkey in exchange for $15 billion. At the time, Flynn was first DDT’s campaign surrogate and then his National Security Advisor. He threatened to withhold federal funding from the disastrous California wildfires that have now killed over 70 people. He threatened France with tariffs. 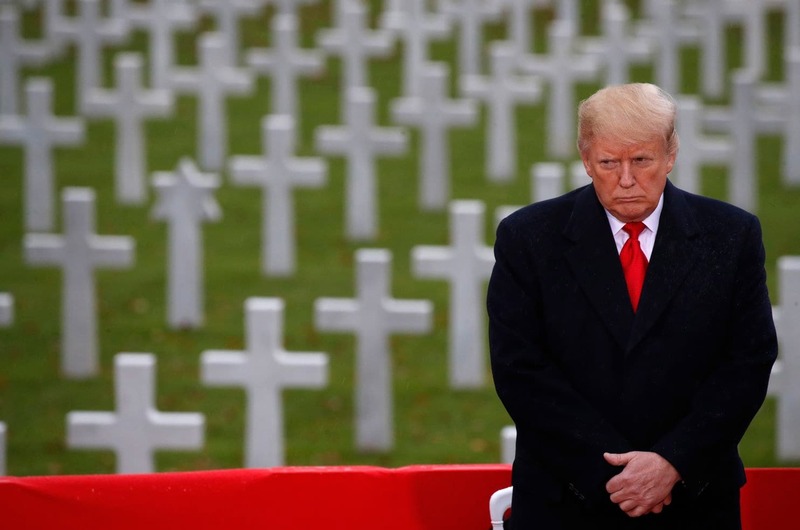 He blamed aides, especially Deputy White House Chief of Staff Zachary D. Fuentes, for not telling him that he would look bad if he didn’t attend the 100th anniversary of World War I at a cemetery near Paris. His Twitter attacks on France occurred on the anniversary when 130 people were killed in Paris from an extremist attack. He sent no condolences for the tragedy. He encourages his followers to be violent against Antifa protesters. He claimed before the election that he would finish a “very major” new tax cut—that congressional members knew nothing about—but, like the caravan in Mexico, no one talks about it now. He justifies voter ID by saying that no one can buy cereal without an ID. DDT’s “improvement” in the GI Bill is now blocking housing, loan, and tuition for tens of thousands of veterans, a situation further complicated by his closing the VA’s Office of Economic Opportunity and resulting in “dire circumstances” for veterans. Even worse, VA officials testified that they had no idea when the information technology system, also blocking GI Bill benefits, will be updated. With delayed or never delivered payments, some veterans face debt or homelessness. A large number of veterans have been waiting over 60 days. The VA said that they didn’t expect payments to be delayed in the spring—months from now—but veterans may receive the wrong amount of money. DDT can’t explain—even to the troops—why the military is deployed on the southern U.S. border at a cost of at least $220 million by the end of the year. All Defense Secretary James Mattis could find for an answer is that he’ll get them an answer when they see what happens. Over 5,000 service members are looking for something to do in the southern U.S. while people are need to help with the huge wildfires in California where over 1,000 people are missing. Almost 14 months after Hurricane Maria hit Puerto Rico, causing at least 3,000 deaths and leaving many of the residents without electricity, DDT continues to destroy the U.S. territory. He now lies that its government is using federal disaster funding to pay its debts. 0.6 percent were targeted because of gender bias. Of 1,679 religious hate crimes reported, 58.1 percent were anti-Jewish and 18.6 percent were anti-Muslim. A new conspiracy theory from GOP voters: the California fires are caused by “directed energy weapons”—government-directed lasers bent on destroying homes, property, and lives. Soybeans are a left-wing conspiracy to emasculate men and estrongize their bodies—a recent conspiracy theory from the white supremacists. That follows the belief that juice boxes are feminizing male children by keeping them from handling stress (DDT? ), becoming “low energy” (DDT? ), and behaving childishly (DDT?). These people need to find a day job. The latest reason that DDT could not go out in the rain to honor veterans—his hair. Horror novelist and Hollywood writer-producer Stephen King wrote that DDT’s tweets during the past nine days gives “a “window into an increasingly disordered mind.” He added, “Since we are all to some extent his hostages, I find this dismaying and rather frightening.” As DDT’s power diminishes, his rage grows, endangering the entire United States. Transformational News; What Works For Seven Future Generations Without Causing Harm?